Meagan McGrath was born in Toronto in 1977 and raised in Sudbury, Ontario. She enrolled in the Canadian Forces in 1995, and graduated from the Royal Military College of Canada in 2000, with a Bachelor of Science (Chemistry). Upon completion of her Aerospace Engineering training, Major McGrath served for a short time as the Maintenance Support Officer at 19 Air Maintenance Squadron, CFB Comox. She was then posted to Ottawa in 2001, where she worked as an Imaging Radar System Engineer, a sub-project of the Aurora Incremental Modernization Project. On August 15, 2005 Major McGrath was posted to the Canadian Forces Aerospace Warfare Centre Ottawa Detachment, the Air Force Experimentation Centre. Most recently, Maj McGrath has been working on the implementation of a Canadian Forces wide logistics tool. Since 2002, Major Meagan McGrath has climbed many peaks throughout the world, and in particular, the Seven Summits', the highest peak on each continent -see our article on the controversy about the 7 summits. 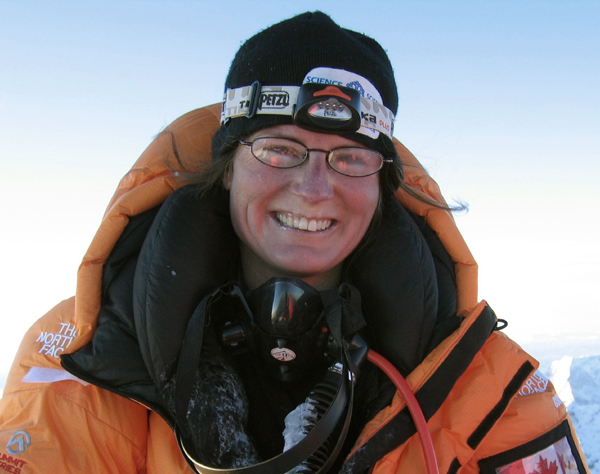 Megan McGrath summitted mount Everest on 21st May 2007. That's how she finaly achievedÂÂ her dream to climb the Seven Summits. In January 2008, she became the First Canadian Woman to summit the Carstenz Pyramid version of the Seven Summits (see our article on the controversy about the 7 summits), becoming the only Canadian woman to achieve both versions of this mountain challenge. She continues to pursue her dream to climb the highest peaks in the world. January 2008 : Carstensz Pyramid (4884 m), in Indonesia. May 21st, 2007 : Mount Everest (8848 m), in Nepal. April 2006 : KosciuszkoÂ (2228 m), in Australia. June-July 2005 : Attempted Gasherbrum II (26,360 ft), Pakistan. 14th highest mountain in the world. Summit attempt aborted due to extreme avalanche danger. Preparation for Everest in 2007. (Gasherbrum is not included inb the list of the 7 summits). December 2004 : Vinson Massif (4892 m) in Antarctica. August 2003 : Mount Elbruz (5642 m), in Russia. June 2003 : Mount McKinley (6194 m), in USA. April 2002 : during a two weeksÂ Safari in East Africa (Serengeti, Ngorongoro Crater, etc), she spent one week climbing KilimanjaroÂ (5892 m). Meagan McGrath was today given permission by the Canadian Air Force to take unpaid leave to embark on her dual aim of reaching the South Pole and then climbing the world's five highest peaks in a single season (spring 2010), i.e. Lhotse, K2, Broad Peak, Cho Oyu and Shishapangma. Still counting? That will mean scaling five mountains during the summer of 2010. To find out more about this adventurer, visit the website of the Canadian foundation DIVA. Created in 1997, Diva is a not-for-profit Canadian charitable organisation whose mandate is the advancement, recognition and celebration of innovative achievements aimed at improving the health and wellbeing of women. Find out how Meagan became an adventurer, how she manages to balance career and adventure and the importance she attaches to keeping herself in good health, plus an interesting video.